A sure sign of beauty and youth is a full head of hair. We dye our hair, put extensions in, spray paint stand even have painful surgery to increase our hair growth which can leave scars and isn’t guaranteed to work. Finally, there is a new procedure that gives the illusion of healthy hair growth and it’s called Scalp Micropigmentation. Scalp Micropigmentation,or SMP, is a cosmetic tattoo that creates tiny dots to replicate growing hair follicles. SMP can also be used to conceal scars from hair transplant surgery or to make thinning hair appear thicker. Women often receive density treatments in the hairline to pull their hair back without worrying about thinning around the temples. Men also benefit by either treating mildly thinning hair to creating a whole density shadow from a bald head. This procedure looks extremely natural and relieves the embarrassing frustration of hair loss and the appearance of premature aging. Pigmentation in the scalp will not wash off in the shower, pool or ocean, finally ! Regain your confidence without having to worry about sweating in the gym or relaxing on the beach this summer. With so many options available to treat hair loss, scalp micropigmentation is reasonably priced and reliable, unlike most procedures. Hair transplants for example often leave nasty scars and cost far more than the value you receive ( $4,000 to $15,000). Wigs are another option, but they are very uncomfortable and there is a risk of displacement, which would be embarrassing. 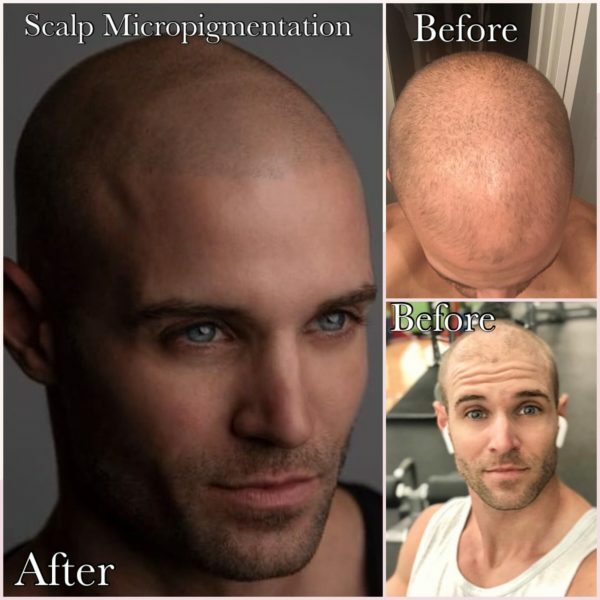 Scalp Micropigmentation (SMP) is a highly advanced method of cosmetic pigmentation and is unique in a variety of ways. SMP involves the use of highly specialized equipment and techniques to inject organic pigment into the scalp. SMP is an extremely intricate procedure with a guaranteed satisfaction result. Luxe Day Spa uses a specific grouping of needles that are 2/3rd the size of traditional body art tattoo needles. Using extremely small needles ensures that we do a perfect follicle replication instead of a blotchy dot. In our next blog we will explain the treatment process, who’s eligible and how the process will work. Reclaim your confidence and get your life back today, you deserve it!!! Eyebrow Microblading Tampa. 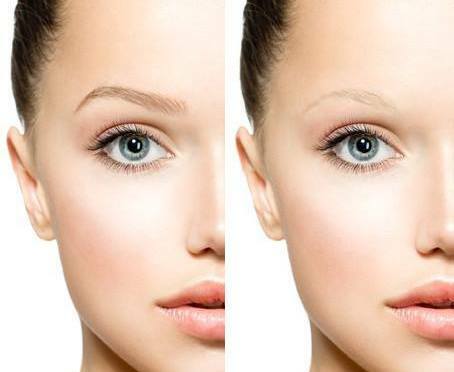 Microblading is not only the most talked about beauty procedure on the market, but also the most desired. Don’t be the only one without the perfect brows come this Holiday season. Luxe Day Spa is having it’s last Microblading Special this year ending on October 31st. After October it will go back to its regular price of $450 with a price increase to $550 starting January 1st. Take advantage of Luxe day Spa’s $50 OFF and FREE touch up and you’ll be sure to turn heads at your Holiday gatherings. Microblading can be as natural or as bold as the client desires. 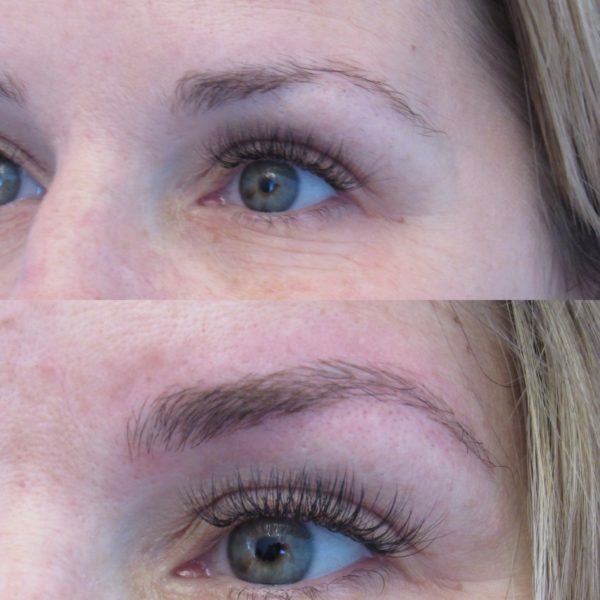 Emily, Luxe Day Spa’s Master Microblading technician and trainer, will make sure the shape, look, thickness, length and color of your semi permanent tattoo is absolutely perfect. Emily will make sure your new brows are a perfect fit for your face shape and size. She’ll start with measuring the points of the face followed by pencil drawing the brows on your face first before she starts. Microblading will last between 1 to 2 years in case you decide to totally change the shape at a later date. If you would like to change the shape in the future, just avoid getting a touch up after 12 months. This amazing beauty procedure not only looks absolutely stunning and natural, but also makes life so much easier. Microblading saves lots of time in the mornings when trying to match the eyebrows, which can take time. Many women go through the same, time consuming, routine every morning of having to pencil in their brows. The lucky ones that have their brows microbladed don’t have to spend any time at all on their brows. price includes the first touch up that is essential between 4 to 6 weeks after the initial appointment. We can’t wait to give you the perfect eyebrows. Call now (813) 280-9917. Microblading Training!!! Finally our fabulous microblading tech Emily will be hosting a microblading and microshading training JULY 1st -2nd. Microblading is currently trending across the US due to its remarkable ability to create full, perfect brows on anyone, even on people whose brow bones are nearly bare. Luxe Day spa microblading, microshading, scalp micropigmentation and lip blush master technician Emily Hedrik launched her own educational program that is equipped with all the right tools to help entrepreneurs looking to break into the beauty industry lay the foundation to a successful Microblading and Microshading business. 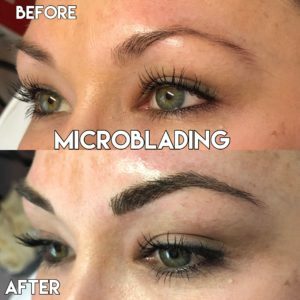 Microblading is a technique using a super tiny, sterile and disposable blades to deposit pigment into skin. The blades are so fine, that hair stokes can be created. The blades reach only into the superficial layers of the skin, which makes the method semi-permanent ( versus permanent, like traditional cosmetic tattoos). Microshading technique is done using the same tools as microblading, but the technique being different so it can create a soft, powdered effect that resembles eyebrow powder. Fastest growing form of Cosmetic tattooing and Permanent Makeup. There’s no skincare license required and you can create an additional revenue stream in this fabulous career. This 2 day course will immerse you in the microblading and microshading experience as you train with an expert in a private studio and of course keep your own kit. Learn all you need to start this super rewarding and profitable career. Be your own boss, making people feel and look beautiful everyday, knowing you will be doing what you love and enjoy and making money at the same time. Spaces are limited and filling fast!! Call or text (727) 563-4289 for details. Spa Specials are here everyone!! December is the month of giving, so how about your give yourself the gift of relaxation, beauty and instant gratification and take advantage of one, two or all of our December Spa Specials or Holiday Spa Packages? 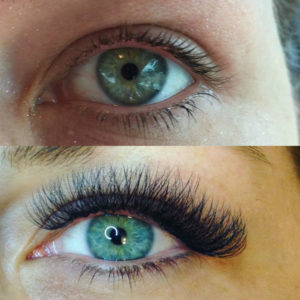 $20 OFF When you book an eyelash extensions refill & a Custom spray tan the same day. Microdermabrasion can be incredibly helpful in relieving these conditions. As a side benefit, it also stimulates the production of collagen in the lower levels of the skin, meaning that a week or two after the procedure, you may notice that your skin feels firmer and looks smoother than it used to. Make sure the spa and the microblading technician are licensed to perform tattoos at the establishment. Search the spa’s reputation online to make sure they have not had any serious mishaps with any client. 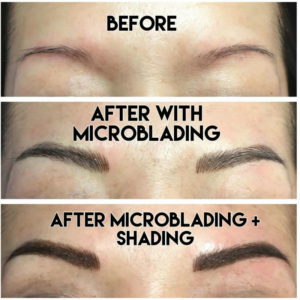 Check before and after pictures of previous work of the microblading technician that will be performing your tattoo. Make a consultation appointment before your actual procedure date, so you can receive all information you will need before getting your eyebrows semi permanent tattooed. At Luxe Day spa in Tampa we guarantee you will have all concerns and questions answered before the drawing or sketching of your brow tattoo starts. Having all questions and concerns resolved beforehand will put you at ease throughout the procedure. 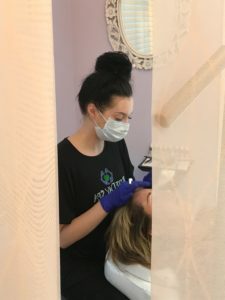 The microblading technician at Luxe Day Spa will be attentive and answer any further questions or concerns you might have during the tattooing process. Check out our before and after pictures on Instagram. https://www.instagram.com/luxedayspasoho/ or on our website https://luxedayspasoho.com/spa-before-after-photos/microblading/ . Microblading, Brow embroidery, 3D brows or Feather stroke? Eyebrow semi permanent tattoo is the hottest trend right now, but there is confusion in the market. The confusion is mainly due to the same procedure having so many different names. Eyebrow semi permanent tattoo is also known as Microblading, Brow embroidery, 3D brows and Feather stroke. Microblading, as it’s known at Luxe Day Spa in Tampa, is a relatively new, manual method of tattooing. 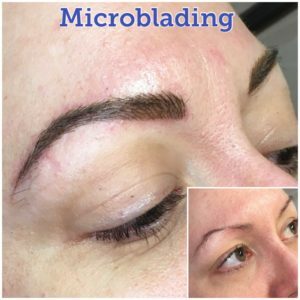 Microblading is done using a very fine blade to deposit pigments into the skin. The microblading technician designs each hair stroke to mimic real hair giving the client the most natural looking eyebrows. The microblading technician performing the procedure must be a licensed tattoo art professional. Additionally, the technician must pass a microblading course to become certified on the technique. All microblading professionals must be registered to perform their services in a licensed facility such as Luxe Day Spa in Tampa. In most states it is illegal to do any type of tattooing in a home. At Luxe Day Spa we follow all the guidelines and guarantee 100% satisfaction with our Microblading services. We make sure every client is informed of all “before and after” care for the perfect outcome of their service. We follow all the required sanitation and sterilization of all non disposable tools used for the microblading procedure. With microblading becoming an increasingly popular procedure, our technicians improve their technique regularly. Through the process of continuous improvement we ensure that the results of each client are the most natural possible. Luxe Day Spa in Tampa provides the best microblading services in the Tampa bay area. We custom design the perfect eyebrows on a client by client basis. From the consultation to the after care, each client is comfortable and secure in achieving their desired results. Luxe Day Spa in Tampa provides the best organic pigments and tool available to the industry. We highly recommend a complimentary consulation before the actual procedure day. During the consultation our microblading technician will advise you of various shapes and colors that best suit your face. Upon request, the technician will do a patch test to rule out any allergic reaction to the pigment.